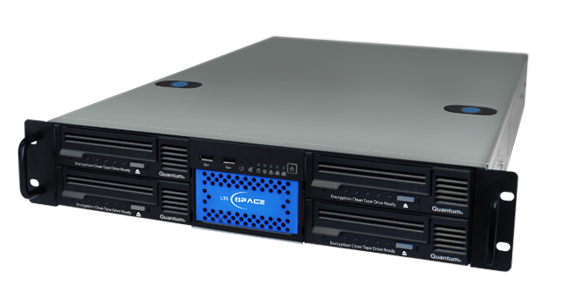 Developed to meet the demanding requirements of broadcasters, its four 1.5TB capacity LTO-5 drives all read and write data at the full speed of each tape (140MBs) for the fastest possible back-up and retrieval of media. In conjunction with a GB Labs storage system, Space LTO runs fast enough to avoid the necessity for the shuttling and scrubbing techniques that stress magnetic tape and jeopardise its viability for long-term back-up. The potential for archiving speeds of up-to 560MBs make Space LTO perfect for multi-channel content creators, owners and distributors. With a plug and play architecture and the easy-to-use Space Manager administration tool, Space LTO connects via 10G Ethernet ports to be up and running within minutes. It is then controlled by a user-friendly web interface that is accessible from anywhere over your network. To ensure future-proofing, the appliance uses the open-source TAR format for data archiving and standard XML files for tracking backup jobs. It is designed to integrate with third party asset management software for total media tracking.